Built in 1901, The Strand Hotel was called "the finest hostelry East of Suez" in the handbook for travelers by John Murray. Sold in 1988, the hotel was extensively renovated and reopened in 1993 as an all-suite, deluxe boutique hotel. A three-story colonial structure, it is listed in the Yangon City Heritage List, is one of the members of the Most Famous Hotels in the World and remains one of the premier hotels in Southeast Asia. Launched at the end of 2015, The Strand Cruise combines the hotels' historic past and character with a luxurious, contemporary river cruise experience. Currently, it is the only ship in The Strand fleet. Strand Cruise is a venture from the owners of the Strand Hotel in Yangon. It offers the same luxury style within a river cruise experience. Launched at the end of 2015, The Strand Cruise is the sister ship of the five-star The Strand Hotel in Yangon, and closely mirrors the hotel's old-world glamour and reputation for personalized service. As a result, the vibe onboard is one of luxury, comfort and exploration. 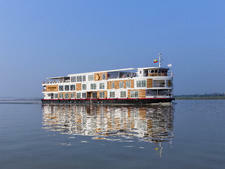 The ship operates just two itineraries -- Bagan to Mandalay (4 nights) and Mandalay to Bagan (3 nights). Shore excursions include visits to the U-Bein Bridge and the temple of Maha Aungmye Bonzan. Activities onboard are suitably upmarket and include the wellness center and spa, a custom-made swimming pool and fitness room. The Strand Restaurant offers cuisine from around the world, while the temperature-controlled wine cellar and Sarkies Bar offer a large selection of beverages. Multiple language are spoken on board, however the main language is English. Rates include three meals during full sailing days, breakfast on day of disembarkation, soft drinks and local beer, house wine during meals, port charges, English speaking guides (alternative language guides can be provided on request subject to availability), satellite WI-FI in all cabins and public areas and complimentary international daily newspapers available on guest's digital tablets. The Strand Cruise attracts a well-off crowd with a taste for luxury exploration, culture and history. Passengers are generally couples or family/celebratory groups. The fleet consists of just one ship, The Strand.